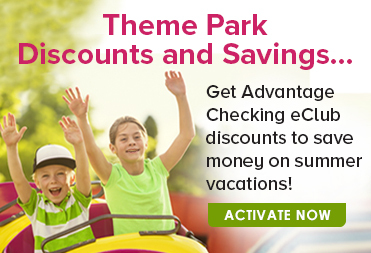 Advantage Checking includes eClub benefits and discounts like theme park or entertainment specials, shopping or travel discounts, cell phone replacement coverage, full identity theft service, extended warranty coverage and more. To access your eClub discounts and savings, simply activate your benefits by entering your Access Code issued during account opening in your Advantage Checking Welcome Kit. For help with activation, call a Member Service Representative at 928.783.8881. To inquire about benefits after signing up, contact eClub at 866.210.0361 M-F 8:30-5:30pm EST. For more information about eClub benefits, visit eClub or call 866.210.0361 M-F 8:30 - 5:30pm Eastern. **$7 monthly service fee applies for Advantage Checking. Minimum deposit $25 to open account. Interest-earned on the daily balances $500 or greater. Fee may reduce earnings. Please see fee schedule for applicable fees. Certain restrictions apply. Minimum deposit $25 to open acount. For each month the qualifying relationship requirement is not met, a $5 monthly service fee will apply. Please see fee schedule for applicable fees. Certain restrictions apply. 1 Wireless carrier fees may apply. 2 IDProtect service is a personal identity theft protection service available to personal checking account owners and their joint account owners. The service is available to non-publicly traded businesses and their business owner(s) listed on the account (service not available to employees or authorized signers who are not owners). Service is not available to a “signer” on the account who is not an account owner. Service is not available to clubs, organizations and/or churches and their members, schools and their employees/students. For revocable grantor trusts, the service is available only when a grantor is serving as a trustee and covers the grantor trustee(s). For all other fiduciary accounts, the service covers the beneficiary, who must be the primary member (Fiduciary is not covered). Insurance products are not a deposit; are not NCUA insured; are not insured by any federal government agency; are not guaranteed by credit union or any credit union affiliates. ClickSWITCH is the fast, secure and free way to switch your direct deposit and automatic payments to your AEA checking account!